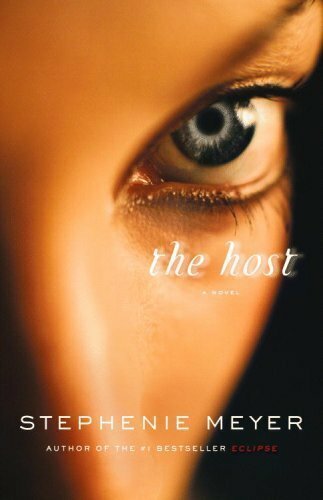 Gentian Violet: Book Review: The Host by Stephenie Meyer. I really can't write reviews. But I have desperately wanted to write this one for a long, long time now. First things first, if you be a Twilight hater, don't judge this book just because of it's author. This book has a very intriguing story to tell, which has nothing to do with the Twilight series, or even vampires for that matter. This story unfolds in a universe where earth has been taken over by an alien race, called Souls, which inhabit humans and live as parasites in their bodies. The humans are called hosts. Before you start imagining aliens with superpowers and multiple limbs and spaceships and what - not, please stop. This book is nothing like the usual science-fiction fare out there, which is lapped up by many an over- eager geek (including me). Oh no. The book tells, in fact, a most memorable and moving love story (ladies, are you listening? ), and it involves nothing about radioactive aliens and genetically mutated offspring, rest assured. It is a unique combination of science-fiction, romance and drama. I love me some drama.Of course, it has its own dose of sappy lines. And I found I didn't mind them that much. Do try to ignore the prologue if by any chance you get bored by it. Do not, I repeat, please do not give up on the book, just because the prologue and the first couple of chapters seems boring. We get to meet Wanderer (Wanda) first, she is the alien, the Soul. I have to say hers is the most idealistic and most humane fictional character I have ever come across in a book. How ironic then that this character should actually be an alien. You get to know her better as the story progresses, and you come to love her, like everyone else in the book seems to. Then we meet Melanie, she is the host whose body Wanda has been given to inhabit. When a Soul enters its host, it starts anew in the host body, the host's mind having been erased out. The Soul is supposed to be in complete control of the body. However, this does not happen with Wanda, who, when she wakes up in her host body, discovers, soon, that her host, the original owner of the body, Melanie, is still alive and present inside her head! This leads to a unique situation, and forms the plot for the story. Melanie is portrayed as a fierce, independent, and beautiful woman, a survivor, someone I would love to become like one day. Melanie loved a man, Jared, in her lifetime. The way she sees him in her memories, which Wanda now has access to, makes Wanda fall in love with him as well. Messed up, I know. Unable to control and extinguish her stubborn host, and unable to control her own strange desire to see Jared, Wanda, along with Melanie of course, sets out in search of the man they love. I love the way the author portrays the human race throughout this story, as seen through the eyes of an alien. It just shows people, in general, in a whole new light to me. And I love the flashbacks in the initial part of the novel, that is all I kept reading for, in fact. This is a wonderfully told tale, though a bit slow at first, with many unforgettable characters, hateable villains, and tear jerking moments. I have read this book five times, and I wept at least a little every time. And I am not such a sap, in general. I swear. I love that this book doesn't have a tall, dark, and handsome hero, who sweeps in to save the girl and to save the day. Oh no. This is the two heroines' book, all the way. All the human characters (both male and female) in this book are flawed, and amazing, and lovable, and well, human. I love the author for creating them. And then we have Wanda, the alien, who's almost flawless. Another victory for the author here. Somehow, through this book, the author makes me value being a human, something I never even thought about before! Judging by the number of times I have used the verb 'love' while writing this review, I think you can gauge how much I, err.... love this book. I am so glad I own this book, and I look forward to reading it many more times in the future, curled up and happy, knowing it will always satisfy my need for romance and drama, and leave me with a warm happy feeling and a satisfied smile every time I read it. Thank you, Stephenie Meyer. A 10/10 and a huge hug for you. 1.“I held you in my hand, Wanderer. And you were so beautiful.” - Ian. 2. "Something I've never seen in all my lives. I'm staring at...hope." - Wanda. 3. "I won't erase you, Melanie" - Wanda. 4. "My house, my rules" - Uncle Jeb. 5. "Eight full lives. Eight full lives and I've never found anyone I would stay in a planet for, anyone I would follow when they left. I never found a partner. Why now? Why you? You're not of my species. How can you be my partner? It's not fair. I love you." - Wanda. 6. "You and I won't lose each other, I will always find you again. No matter how well you hide. I'm unstoppable." - Jared. 7. " It's a strange world." 8. Ian: "She is. Melanie is a very pretty girl. Even beautiful. But pretty as she is, she is a stranger to me. She's not the one I... care about." Ian: "That's not true at all. It's not the face, but the expressions on it. It's not the voice, but what they say. It's not how you look like in that body, it's what you do with it. You are beautiful." 9. "You never know how much time you'll have." - Melanie. 11. "Right now, if I was given the choice between having the world back and having you, I wouldn't be able to give you up. Not to save five billion lives." - Jared Howe to Melanie Stryder. I think Meyer has this recurring thing with writing about people from different worlds who arent supposed to fall in love, but they do and put everything else at stake for this Love. Still, it'll take a lot of convincing me to pick this one up. I still have a bad after-taste from when a cousin made me read three chapters of Breaking Dawn. I can understand why a lot of people might not like the Twilight series, the books are kind of written that way. I too noticed it once I got past the novelty of the story. And if you directly read Breaking Dawn, no wonder about the bad after-taste. This book isn't really about people putting everything else at stake for their love. No, in fact no one does that over here, now that you mention it! It's a very different book as compared to the Twilight series, you should definitely try reading it. If ever you read it, do let me know how you liked it (or not). "Why won't you answer me?" Jamie was really crying now but trying to muffle the sound. I crawled off the bed, squeezing into the hard space between the mattress and the mat, and threw my arm over his shaking chest. I leaned my head against his hair and felt his tears, warm on my neck. "Is Melanie still alive, Wanda? Please?" He was probably a tool. The old man could have sent him just for this, Jeb was smart enough to see how easily Jamie broke through my defenses. Jamie's body shook beside me. Melanie cried. She battered ineffectually at my control. But I couldn't blame this on Melanie if it turned out to be a huge mistake. I knew who was speaking now. "She promised she would come back, didn't she?" I murmured. "Would Melanie break a promise to you?" Jamie slid his arms around my waist and clung to me for a long time. After a few minutes, he whispered. "Love you, Mel." “NO!" She shouted through my lips. Jared caught her hands, then caught me against the wall before I could fall. I sagged, my body confused by the conflicting directions it was receiving. He groaned in relief. "I knew you could do it! Ah Mel!" He kissed her again, kissed the lips that she controlled, and we could both taste the tears that ran down his face. Jared jumped back from both of us, and I slid to the floor, landing in a wilted heap. He started laughing, "That's my girl. You still got her, Wanda?" What the hell, Wanda? She screeched at me. Where have you been? Do you have any idea what I've been going through trying to find you? Sigh, I want to read this book again. And you should listen to me ALL the time!